Have you ever wondered what a men’s salon experience would be like? Women go to the salon, spend the entire day gossiping, laughing, and leave feeling happy and energized. At Hair Mechanix of Westland, Michigan, we have transformed the salon experience putting our focus on men. As a full salon for men in Westland, Michigan, we have transformed your everyday barber shop into a salon designed by men with men in mind. Our team of stylists is made up of beautiful women who are ready to service you. Need a quick cut? Body waxing services? We do it all and invite you to take “getting a haircut” to an entirely new level. Our stunning stylists know the mechanics of hair. Men’s hair to be exact. We offer many men’s hair cutting services in our high-end salon located in Westland, Michigan. Do you have a passion for cars? Do you spend a lot of time in your garage? If so, let Hair Mechanix be your new garage! When you walk through our doors for the first time, you will see exactly what we are talking about! Keep in mind we are not a Michigan barber shop. We are a full-service men’s hair salon Westland, offering men’s body waxing services, men’s hair cutting in Westland Michigan, or hair coloring for men in Westland. We invite you to come on in and enjoy our relaxing hair salon environment for men today. Men’s Hair Salon Westland On Ford Rd. Our hair salon for men in Westland is located on Ford Rd. just west of Newburgh on the north side. Contact us now to make an appointment. Walk-ins are available. 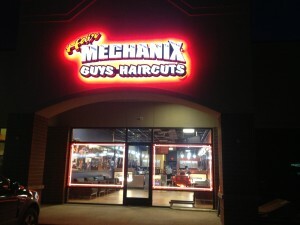 Not a resident of Westland but would like to take part in the Hair Mechanix experience, we have a mens salon in Waterford, men’s haircuts in Livonia, haircuts for men in Madison Heights, or Southgate men’s hair cutting salons.